Some people have the notion that extreme sports are crazy, and in some ways, they are right! After all, isn’t chasing a tornado for the fun of it crazy? However, storm chasers who are really into storm chasing do not often think about the dangers that await them if they make a mistake while being so close to a powerful force of nature. Instead, they experience a different kind of thrill when they get up-close with a visual representation of a powerful natural wonder that can wipe out a whole town if it wants to. 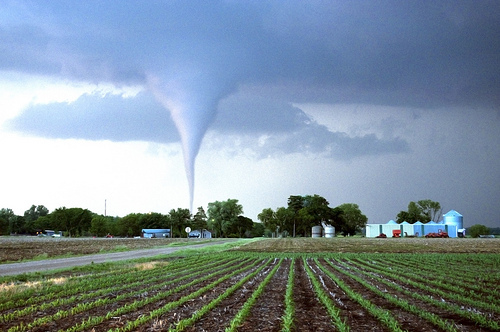 Many describe storm chasing as a “fieldtrip of fear and fascination”, and if you do get to watch some videos by the Tornado Alley storm chasers, you’ll easily understand what they mean. What began as a typical excursion of meteorologists studying the weather in Central America where storms are commonly formed by the cold front from Canada and warm front from the Gulf of Mexico quickly gained the interest of common citizens, as very graphic videos of storms were broadcast on TV. In no time, storm chasing became a big business and major attraction in Tornado Alley, where it is considered as one of the best and most dangerous extreme sports. The original Tornado Alley storm chasers brought their own equipment with them and took great efforts to understand how storms and twisters work. But today, almost anyone can be a storm chaser if they choose because storm chasing guides are now available. If you have no experience with storm chasing, doing research and going out by yourself to the turbulent Great Plains of the United States isn’t the way to do it. 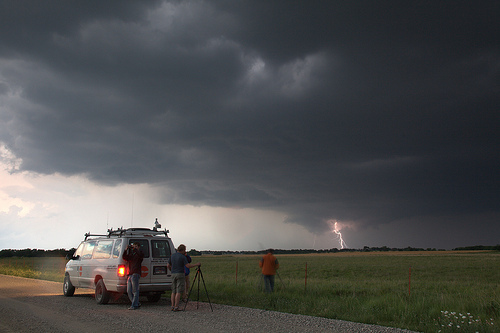 You can join a group of Tornado Alley storm chasers that regularly host tours and storm chasing adventures in the most turbulent seasons in the Plains. A trip usually takes six days, wherein you could find yourself anywhere in Kansas, Iowa, Colorado, New Mexico, Nebraska, South Dakota, or Oklahoma– wherever the most turbulent of storms can be found. You are not required to bring any special equipment with you, since this will be provided by the storm chasing group you will be joining. 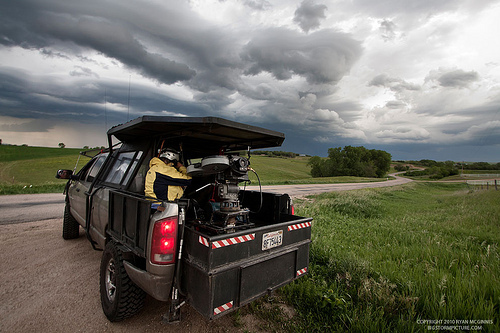 However, should you choose to bring your own weather and radar equipment, make it a point to check with your tour group to avoid unnecessary clutter inside your storm chasing vehicle. It is also ideal to bring your own camera and your insurance slips just in case you end up needing medical attention (you’re trying one of the most dangerous extreme sports, so what do you expect?). Storm chasing in Tornado Alley is only possible during certain times of the year (generally between May and July), and you will have to book early if you want to take part in the annual storm chasing trips scheduled for this year. Joining a storm chasing group will surely double the fun since you will be joining other daredevils in this perilous, yet oddly-exciting journey. So, what are you waiting for? Book your storm chasing ticket now and prep up that camera of yours for some violent and graphically-exciting storm footage! If you make it out alive we’d love to hear from you. This entry was posted in Bizarre, Colorado, Kansas, Oklahoma, Storm Chasing, Travel, United States and tagged storm chasers, storm chasing, Tornado Alley. Bookmark the permalink.